2012 was the first Christmas we ever celebrated in our own home. (If by “our own home” you mean “second floor apartment”). After eight years of spending Christmas traveling, I was SO excited to do Christmas on our own, especially since it was the first year where Ella was really into the whole concept. That year, I spent several weeks putting together a collection of classic Christmas books and wrapping them all so that Ella could open one each day until Christmas. She was thrilled about opening a present every day, plus reading to a toddler was an activity I could do while holding a newborn, so that was very appealing. It didn’t quite go as planned, though, because she ended up being way more excited about unwrapping the books than actually reading the books, and from then on, I just got all the books out at the beginning of the month we could enjoy them all. Plus, the idea of wrapping 24 books wasn’t that appealing to me anymore. I just keep them in a basket by the tree and voila – holiday cheer! However you do it, these books are so fun to read all month long. I’ve tried to include classic Christmas books plus some newer ones, funny books and more serious ones, plus religious and secular titles. (And, of course, you can always look at the previous Christmas book lists too, which have tons more options. I think last year’s list was particularly good – it was something of a banner year for Christmas picture books – and I also have lists from 2014, 2015, and 2016!). One of the things I love most about Christmas is the stillness that you sometimes experience. This Christmas book perfectly captures all the different kinds of quiet that you can experience at Christmas and it was one of the very first books we added to our Christmas collection. My sister-in-law, who is a phenomenal gift giver and has supplied us with many excellent Christmas books, gave us this one several years ago, along with Toot and Puddles: I’ll Be Home for Christmas and they’ve both held places of honor in our Christmas line-up ever since. Think Frog & Toad but with pigs. This is a new Christmas book this year that has a distinct Dr. Seuss feel to it, thanks to the rhyming storyline. This book repeats the classic “The Night Before Christmas” poem stanza by stanza on the left pages while the right pages have an original poem that shows a little boy who IS stirring and sneaks up to the roof to joyride in Santa’s sleigh. My mother-in-law and brother-in-law recorded an audio version of it to go along with the paper copy about ten years ago, and it’s so fun to listen to them read it (more details about doing your own DIY audiobooks here). This is the most classic of classic Christmas books, so it’s only right to have a picture book version for little readers who are too young for the full-length chapter book. I grew up with this book, so it feels like one of the classic Christmas books to me. In it, the animals find Santa in the woods and he retells the story of Christ’s birth to them. Oh, it’s just so beautiful. This might be my all-time favorite Christmas book. I LOVED this one growing up, with the sweet stories of a pig family getting ready for Christmas, and just looking at the illustrations makes me feel cozy. This is a new Christmas book that takes place in a beautiful forest with winter animals hiding behind every flap. This is FOR SURE Tally’s favorite Christmas book this year. You probably already know Rinker from her super popular construction books, but this holiday one is a new and delightful addition to the lineup. I love the unique illustrations in this beautiful retelling of the first Christmas. Frankly, I can’t even look at the cover without getting a little teary-eyed. I love the books in the Mouse’s First series, and this one is no exception. They’re just all so sweet and charming. 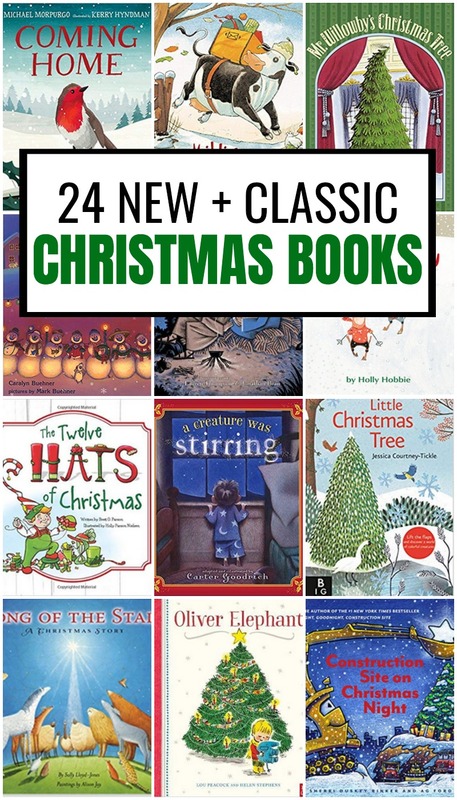 Perfect classic Christmas books for the youngest little reader. Millie the cow loves delivering mail, especially when the holidays roll around. But when she gets lost on a delivery, Christmas might be ruined. When darkness falls and the world is quiet, how do snowmen celebrate Christmas? In SERIOUS style. I love this new Christmas story about a mom and her two young children who head to the department store for Christmas shopping (complete with the little boy breaking something by accident). The outing ends with a little stop for a treat, but everything goes wrong when they discover that beloved Oliver Elephant has gotten lost. For every child who has felt like it just takes TOO long for Christmas morning (and the presents) to arrive, this book hits just the right notes. This was a Bookroo pick a couple of years ago and it immediately snagged a spot in our Christmas book line-up. A class bakes gingerbread cookies that escape and all the children have to hunt them down. But are they REALLY escaping or is the teacher just playing a holiday trick? Gretchen Rubin once said something about Laura Ingalls Wilder books being the definition of home, and when it comes to Christmas, I think that’s double-y true. I love Alison Jay’s illustrations and her Christmas books are some of my very favorites (I love her The Twelve Days of Christmas). This is the nativity story told in the most beautiful way. This was probably Ella’s very favorite Christmas book when she was 2 and 3, and I can’t blame her. I love the beautiful illustrations and all the animals making room in a stable for Baby Jesus. On a snowy night, a grandmother and her two grandchildren find a sick deer in the forest and take him home to nurse him back to health. Of course, this is no ordinary reindeer as they discover when Christmas arrives. If I had to pick 5 classic Christmas books, this would absolutely be in that top five. Mr. Willowby’s beautiful Christmas tree is just a LITTLE too tall, so he chops off the top and it becomes a perfect tree for someone else. But it’s a bit too tall for THEM too and so on, until everyone has a tree just right for them. This classic Christmas book is from the 60s about a little mouse who saves a piece of cheese all year long to give to Santa. One nice thing about living with my in-laws was that when new books would arrive, my mother-in-law would look through many of them and tell me which ones were worth reading. This new Christmas book got a thumbs-up from her and I agree! It’s about a robin trying to find his way home in time for Christmas. The illustrations are stunning and the story is so sweet. I don’t generally think of cats as part of the nativity story but in this one, a mother cat leads her kitten to see the Baby Jesus and it’s very sweet. What fun. I love the idea of getting library books and wrapping them to add to your collection. Between the books and the Advent activities, you, Bart, and Ella are going to have a great Christmas. And we are excited for Ella's little sister to come and join in the fun. Hope everything goes well. I hadn't done this before, but my oldest daughter, who is 11 – and way more organized than her mother- got this lined up, and I have been wrapping a few books here and there. Just 10 more to go! Then we'll start in with the book a day thing until Christmas, too. I included a few chapter books – A Newbery Christmas and Truce by Jim Murphy for my older girls that we obviously can't read all at once. The best countdown to Christmas idea I've ever heard!! My mom gave Llama Llama Holiday Drama to T this year, and it is darling. Although nothing can compare to the original Llama Llama. This is the first year we're doing our own thing, too. And even though T doesn't get it, it's nice because he doesn't expect certain traditions. We might fly the coop and head to Tahoe for Christmas! We'll see. I love this idea! It makes me want to dig out my favorite Christmas books – although I guess Clara is a few years away from appreciating The Christmas Miracle of Jonathan Toomey. Wow, I am in love with this idea. Great, as always! I've always wanted to do this. Maybe I still can a day late. I think I have more than enough books even without the library. Of course I will have to make them take turns opening them. . . I am so curious about Mr. Willoughby's Christmas Tree… our favorite is called Once There Was a Christmas Tree. Same story, but with all animals. It looks like it might be an updated version of the same story? Mooseltoe by Margie Palatini is popular with my little guy. We got it as part of a Christmas book pack from the Scholastic order form. We got 12 books for less than $20 total so less than $2 each. I read a different book to him each night for the twelve nights before Christmas. Mooseltoe was, by far, his favourite. If you have access to Scholastic order forms through school or preschool, it might be worth it to pick up a pack for next year. It'll save you from stressing over late fees from the library and you can always donate them after your children have grown out of them. I love this idea! We are planning to start this tradition this Christmas with our 1 year old except we will only be doing 12 days of Christmas. I don't think using library books for an extended period of time is very thoughtful, however. Especially if you are taking most or several holiday books during the holiday season. I am always frustrated when I try to check out a couple of holiday books from our library to find they have all been checked out. The right thing to do is to borrow a couple of holiday books for 2-3 weeks maximun; allow other families to enjoy them during the holiday season as well. One of my favorites is How Santa Got His Job! It is one of the most cleverly written books ever. It goes through all the jobs Santa had which led up to he became Santa. For example chimney sweep ( he never gets dirty), mailman (he makes deliveries in the middle of the night), cook at an all night diner (he gains a lot of weight) and so on until the elves discover him at the circus.